Explanation: IC3328 is an otherwise unremarkable dwarf elliptical galaxy about 50 million light-years away in the Virgo cluster. But hidden within IC3328 is a subtle, beautifully symmetric spiral structure! A team of astronomers recently made this totally surprising discovery using detailed digital images from the European Southern Observatory's 8.2 meter Antu telescope. 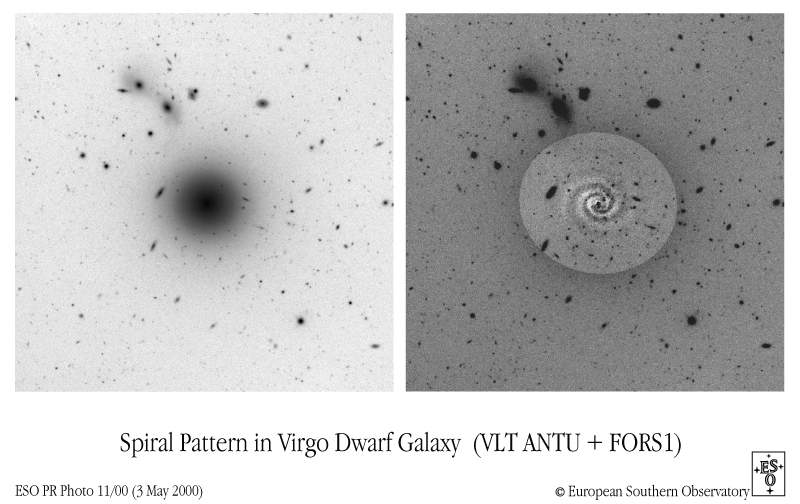 They numerically modeled the smooth distribution of light for this galaxy (left) to enable more accurate measurements of its distance. When the smooth distribution was subtracted from the digital image, the startling spiral structure became apparent (right). 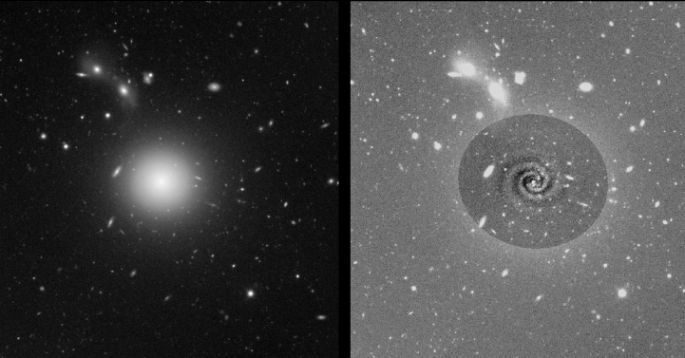 Typical of large, rotating, disk galaxies with density waves, spiral structure is unprecedented in the blob-shaped aggregates of stars normally classified as elliptical galaxies. What created the "secret" spiral in IC3328? Some possibilities under consideration include tidal interactions with nearby galaxies and amplified internal stellar motions.